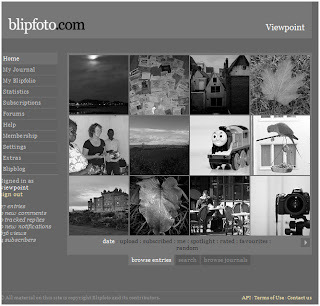 I realise that I've been rather negligent of this blog since June and I'd just like to say that it's not all down to my new obsession with `Blipfoto'. I really have been very busy and when I get a few more minutes I'll share some of the ideas linked to my new project: Geography and the Global Dimension. However - I have become a little obsessed with this photo-blogging or photo-journaling website since a friend told me about it. There are several things that appeal to me about the website: first it keeps me in touch with a friend who now lives in Spain and we can share some of the things that interest us (I know many people use Facebook to do this but I quite like the different `tone' of Blipfoto), second I can keep my own journal which I hope to be able to look back to in future years and third MOST IMPORTANT from my point of view is that I can read the journals and look at the images of people who live in and beyond the UK. Doreen Massey (OU Emeritus Professor of Geography) said something like `Space' is the meeting point of a thousand stories and Blipfoto certainly is that. One of my favourite journals is written by HPX who lives in New Zealand. It has felt quite a privilege to read her journal entries about the latest New Zealand earthquake and to gain a sense of how the earthquake has affected her and the people of Christchurch and district. I hadn't realised how long and how frequent the aftershocks of an earthquake can be. It has been a real eye-opener for me to read her entries and see the way she weaves in the normality of everyday life with the constant terrifying threat of what the next `rattler' might bring. I also love the story of `Brian the Snail' - why not follow his adventures for the rest of the week. I think this very simple tellingof a photo-story is something that we could use with children.